London goes to market at Covent Garden, the one district which is astir early. Six o’clock is late and at eight the bargain hunters begin to be seen. At ten the garbage is being swept up and picked over by street combers, and before noon this heart of old London is deserted. The actual area of Covent Garden seems small to encompass the central food supply of the world’s biggest city until one notices that it really trickles through the ramifications of a maze of neighbouring streets. Stalls, push-carts, wagons, costers and their donkeys, and barrows with peddlers of all ranks link up Holborn and the Strand by a livid stream of humanity and its paraphernalia in a most amazing fashion. All the stall owners pay a tax for the privilege of selling produce in London streets hereabouts as a ground rental to the Duke of Bedford, London’s largest landowner. Covent Garden and the surrounding streets are his property, as well as the houses which line them, and the enormous rentals pay a truly royal tribute to the wealthiest of Britain’s peers. London markets in general are perhaps the dearest in Europe. Continental Europe and North Africa are Britain’s market gardens, though the English housekeeper still clings fondly to the belief that whatever is grown in her own country is the best, the shopkeeper encouraging her in this delusion. The catch phrase in the English shop is, “Best English, ma’am,” though the produce may be asparagus from Provence, little potatoes from Brittany, tomatoes from Algeria or eggs and butter from Denmark and Norway. In spite of all this the English housekeeper will readily pay more for produce grown at home than for that which comes from across the Channel, the North Sea or the Mediterranean. This is not because the quality is actually superior, but because it is home-grown, though this may be prejudice quite as much as patriotism. Covent Garden market has its chief picturesque element in its costers and their environment. The coster in his velveteens with many rows of “pearlies” heaps up his tiny barrow, drawn by his faithful “moke,” and perambulates green stuff through London’s East End, accompanied by his “Harriet,” the couple forming the typical ‘Arry and ‘Arriet of the comic papers. Like most picturesque survivals, modern life is ironing him down to the flat ugliness of the average London type, and his be-buttoned costume is fast changing into the commonplace garb of the British workingman, though his partner still flaunts her hat of bedraggled plumes, which is always in fashion among her kind. She buys these plumes through a “feather club” by paying a weekly instalment. No more unsuitable feminine head adornment for one of her class could be conceived than an ostrich plume, which, by the very order of things, is most unsuitable for the misty, moisty climate of the banks of London’s river. The coster barrow-vendor buys cheap stuff to begin with, and sells cheaply too, so that his margin of profit is slight, but he will go hungry before his “moke” will, and he treats the little animal better by far than he does his own family when it comes to distributing favours amongst them. Weights and measures with the English small shopkeeper are queer and untrustworthy. 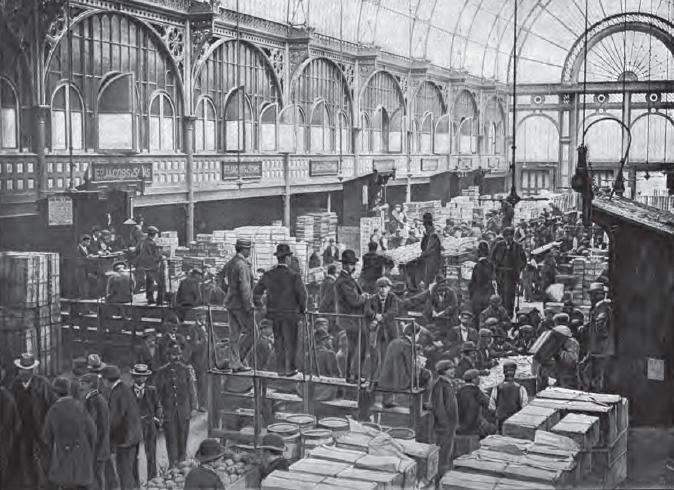 Not long ago a bitter discussion was carried on through the press on the subject, and the defence of the marketman was not a denial so much as an excuse that he had to make up somewhere for the long credit system that prevails among the clientele of all classes of traders. This made for losses which could not otherwise be met. The cost of living is a factor here which is being discussed in its higher reaches. A scarcity of food of certain kinds accounts for some of this, an extravagant attitude towards life for more, and the actual conditions of luxury and convenience under which the food supply is purveyed in this twentieth century for much more. The thing is noticeable in England, in Germany, in France and even in Italy. There is no monopoly of this state of affairs in America; all classes all over the world are feeling it, but are doing very little that might really combat it successfully. In England one buys fowls and fish in the same shop. Ice is a luxury that can often only be had of the fishmonger, and as a favour on the part of that usually high-handed individual. Such a small lump as one may get for a few cents melts into a mere spot of dampness by the time it is delivered and seems hardly worth the while. If one buys anything of an exotic nature in England it costs money. To depend upon a purely British home-market bill of fare, on the other hand, is monotonous, for the supply is exceedingly limited as well as to variety as to quantity. What an interesting post. Good information for history buffs that want to know the feel of really being there at the time. Thanks.